The British Board of Film Classification has passed a number of extras for the March release of the two William Hartnell stories The Space Museum and The Chase. Defending the Museum - 9'26"
My Grandfather The Doctor - 10'3"
The Space Museum - Picture Gallery - 4'24"
A Holiday for the Doctor - 13'59"
The Thrill of the Chase - 10'24"
Doctor Who - Follow that Dalek - 11'58"
Give A Show - Slides - 12'13"
Shawcraft The Original Monster Makers - 16'57"
The Chase Photo gallery - 5'7"
Last Stop White City - 13'14"
Beyond the Screen - 21'54"
Daleks! Conquer and Destroy - 22'36"
The stories are due for release in the UK on 1st March 2010. The Board have also cleared the three documentaries Doctor Who - Greatest Moments, which were shown on BBC Three in the summer. These documentaries appear to be included as extras in the February release of Dreamland. The BBC has revealed that BBC Three repeats of The End of Time will have available an audio commentary from outgoing executive producers Russell T Davies and Julie Gardner. The commentary for part one will be available on Freeview, Virgin and Sky on Sunday 27th December at 7pm, while the commentary for Part Two will only be on Virgin and Sky on Sunday 3rd January at 7pm. Neither commentary will be available on Freesat. The commentaries are expected to be broadcast on BBC Radio 7 and thus will be available worldwide on the BBC i-player. Part One has been scheduled for 3am on 26th December, with Part Two airing at 2.30am on Sunday 3rd January. In addition, the Christmas Eve, 9am, BBC Three repeat of Dreamland will also have a commentary, this time with writer Phil Ford and the director Gary Russell. Every year there is speculation on which show will top the British TV ratings on Christmas Day. Fans and media commentators also speculate how well Doctor Who will fare against other festive programmes. This year, the odds given by online betting company Skybet place Doctor Who as coming in second place at 6/4, with the top spot expected to be Eastenders with its usual 'explosive' Christmas storyline, at 4/6. Third place is given to the other perennial soap Coronation Street, at 12/1. Most popular programme of the year (so far!) has been the ITV juggernaut The X-Factor, which saw a peak of some 19m+ viewers tune in to the final last weekend. In terms of average ratings for the entire programme, the final Britain's Got Talent, also on ITV1, in May, is currently the top-rated show of 2009. Tune in for The End of Time part one on Christmas Day, BBC1/HD, 6:00pm! This week's issue of Doctor Who Adventures comes with eight gifts – a 2010 calendar, two bookmarks, a hologram sticker sheet, three postcards and a mask of the Master. 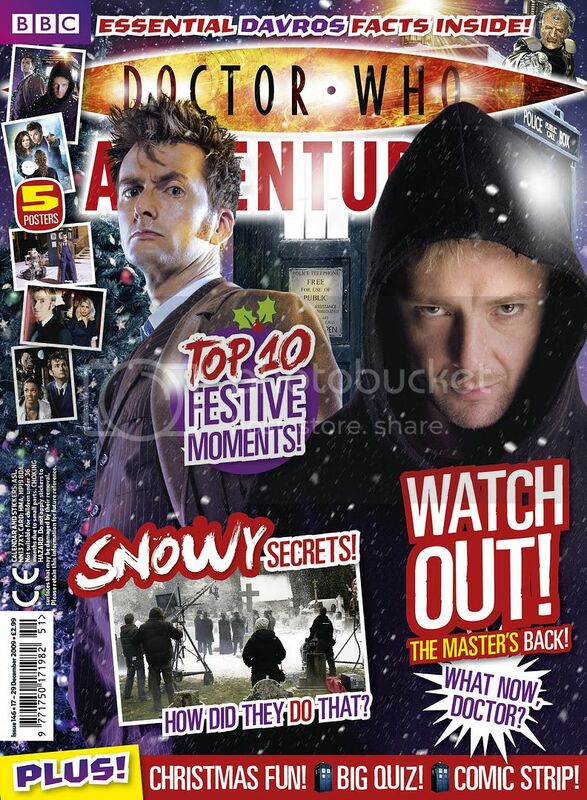 Inside, Doctor Who Adventures reveals the Top 10 Christmas moments, there’s a preview of The End of Time, the Tenth Doctor’s final adventure, and an look at how the Doctor Who crew created a winter wonderland in the middle of July. 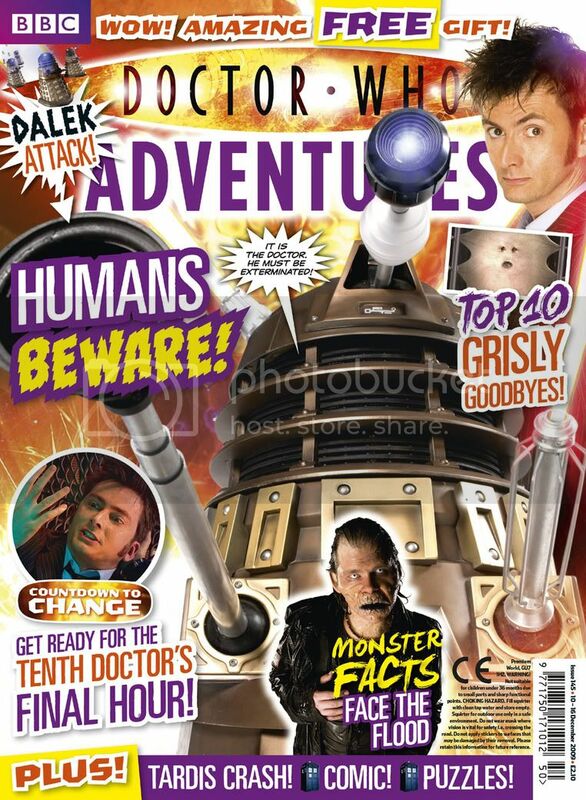 Readers can claim five free Doctor Who magazine files. They can also enter a competition to win a Doctor Who bedroom. Plus the big Christmas quiz and a festive comic strip, Doctor’s Data all about Davros and Five fantastic posters. David Tennant has given a brief interview to BBC News, talking about his feelings on leaving the role of the Doctor. The interview was recorded on the TARDIS set in May. As he nears the end of his time in Doctor Who, Tennant tells Lizo Mzimba about how the role has affected him and his thoughts on his final story. Part of the interview was also shown on the BBC's main evening news programme, The Six O'Clock News. The press showing of The End of Time is Thursday night in London. The Doctor Who themed edition of Never Mind The Buzzcocks got an audience of 2.9 million viewers according to unofficial overnight figures. 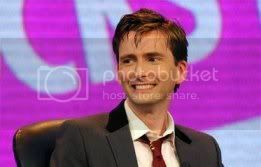 The programme, which was presented by David Tennant, and starred Bernard Cribbins and Catherine Tate, got a share of 14% or the total audience. The rating is much higher than usual for the programme, which, this series, has averaged around 2.1 million viewers per programme. It is the highest rating for the programme since November 2007. Never Mind The Buzzcocks is repeated on BBC Two next Tuesday and is available in the UK on the BBC i-Player. Cable channel Space have issued a Press Release on the Canadian showing of The End of Time on 2nd January, originally reported here. As well as previewing the upcoming special the Channel will be devoting InnerSPACE on December 18th to Doctor Who including an interview with Russell T Davies. The channel also confirms it will be showing Matt Smith's first series in the Spring of 2010. Meanwhile Australian fans are being offered the chance to download Voyage of the Damned free from iTunes courtsy of Australian paper The Age. Interviewed by writer and journalist Matthew Sweet in tonight's edition of Night Waves on BBC Radio 3, new Doctor Who lead writer and executive producer Steven Moffat announced the return of a race of monsters to face new Doctor Matt Smith in the next series of the programme in 2010. 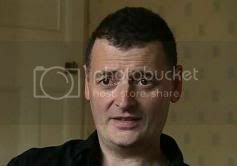 After discussing various aspects of what it was like being in charge of Doctor Who, at the end of the interview Sweet asked Moffat if he could reveal one piece of information known to nobody outside of the production team, as a "teaser" for the next series. Moffat's answer is given in the spoiler box below. "The Weeping Angels are coming back!" 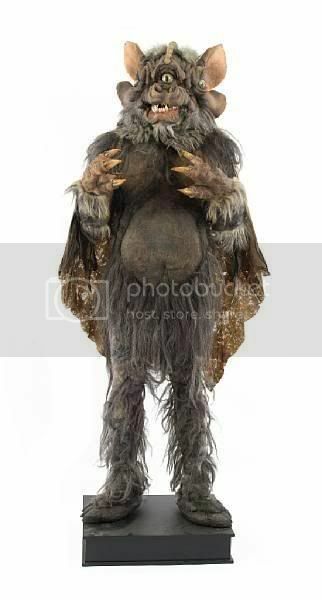 Auctioneer Bonhams has a number of lots related to Doctor Who in its entertainment memorabilia sale on Wednesday 16th December at Knightsbridge in London. 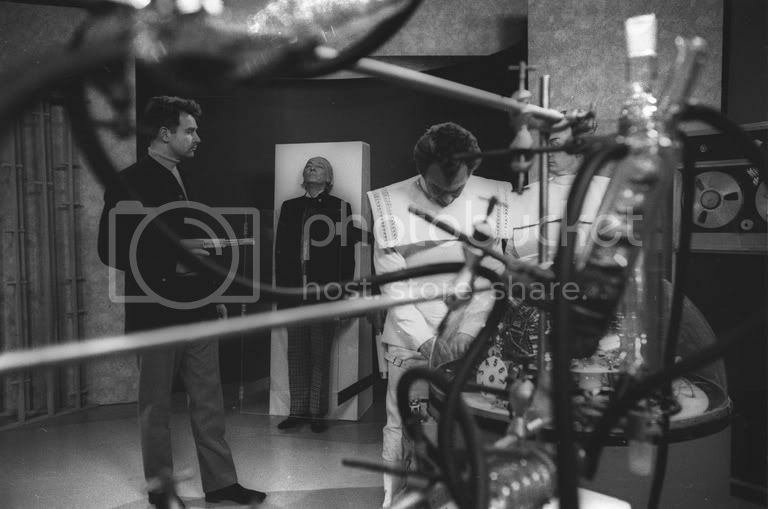 Four rehearsal scripts from The Robots of Death (£250-£300) with a short, typewritten letter dated 14th October 1976 indicating that the part of SV7 was originally offered to the actor Hilary Minster.The role was eventually played by Miles Fothergill. 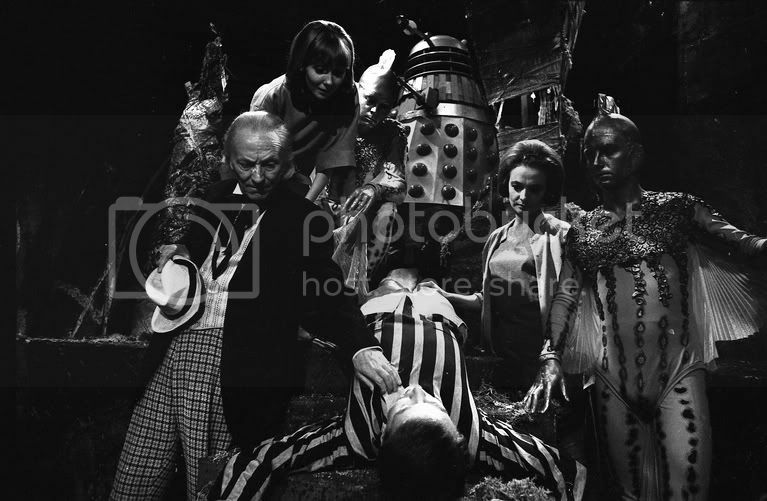 Minster appeared in Planet of the Daleks and Genesis of the Daleks. The auction begins at midday. The BBC have released a couple of Christmas messages from David Tennant, as The Doctor, wishing viewers a Merry Christmas, both of which are available on the BBC's YouTube Channel. The YouTube channel also has a number of clips from the upcoming Doctor Who themed edition of Never Mind The Buzzcocks. Steven Moffat, the new lead writer and executive producer of Doctor Who, will be interviewed on BBC Radio 3's Night Waves programme this coming Tuesday, the 15th of December. The programme is presented by Matthew Sweet, runs from 9.15-10pm, and according to Sweet "He's one of a series of people we're talking to next week who have also recently taken over important cultural appointments." Sweet is himself a long-term Doctor Who fan, who has written several articles about the programme in the mainstream British press in the past decade, particularly for The Independent newspaper. He has also written professional Doctor Who fiction himself, in the form of audio dramas and short stories for Big Finish Productions. Night Waves can be heard live worldwide on the internet, and listened to again on the BBC iPlayer. You can keep track of all major Doctor Who-related programmes on British TV and radio this Christmas with our broadcast summary. Final Ratings Data is now available for the entire run of Series Three of The Sarah Jane Adventures. The final two episodes of the series got a rating of 0.95 million for Part One of The Gift and 0.89 million for Part Two. The audience share for both episodes was 7%. The ratings were once again much higher than the average for BBC One at this time of day with the programmes reaching three times as many viewers as is usual for the timeslot. The audience profile was consistent with this time of day suggesting that The Sarah Jane Adventures was being seen by a substantial number of its target audience on CBBC. A comparison with other new CBBC shows transmitted at this time shows just how well the show is doing with The Sarah Jane Adventures getting more than double the average achieved by other programmes. The highest rated episodes of the series were the two parts of The Wedding of Sarah Jane Smith, which saw David Tennant guest starring as the Doctor. This episode also scored the highest AI figure for the series with a score of 89. Full Audience data is available on Gallifrey Base. In this week’s Doctor Who Adventures you’ll find a story guide about Journey’s End. As Davros and the Daleks plan to destroy the universe the Doctor needs some of his best friends to help him stop them. The Magazine asks why do strange things keep happening to Donna and her family? Find out in this week’s fact file. Doctor Who Adventures also reveals ten of the most grisly goodbyes in Doctor Who. Look out for cyber shocks and the kiss of death! All this, plus the Tenth Doctor in this week’s Countdown to Change, as well as a free Doctor Who gift. Several papers have picked up on the arrival of the TARDIS at Caerphilly Castle in South Wales. The appearance is to promote the castle's Medieval Christmas fayre this weekend. 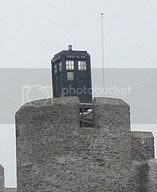 The blue police box is located on top of the Inner East Gatehouse tower and will be lit up during the night. It will stay there until the New Year. The castle was used to film some scenes for The End of Time. The story is reported in The Mirror, The Sun, Wales Online and BBC News. Thanks to ahremsee of Gallifrey Base for the pictures. BBC News have published an article looking into the circumstances leading to the cancellation of the 1979 Tom Baker story Shada. The piece is written by Shaun Ley and is in conjunction with his Radio 4 programme Shelved, due for transmission this weekend. The article provides new insight as to why the programme was abandoned. In the BBC Official History, being written by Professor Jean Seaton, it is suggested that the programme was sacrificed deliberately to make a political point regarding the effects of industrial action by the Broadcasting Unions. The full programme can be heard on BBC Radio 4 on Saturday. David Tennant's Doctor Who finale, The End of Time Part Two, will be celebrated by two free pub events, both running from 3pm to 10:30pm on New Year's Day. One takes place in London in Farringdon, with the other taking place in Manchester at The Lass O'Gowrie pub on Charles Street. Says Doctor Who fan and Lass O'Gowrie publican Gareth Kavanagh: "We'll be using all our big screens and pub system to create a fantastic atmosphere befitting the end of an era. It's free to attend - however, it's first come, first served. Under-16s are fine to stay until 9.30pm but they must be accompanied by an adult." For more details contact Gareth at info@thelass.co.uk. The London event is organised by Jeremy Bentham, who has arranged parties for the premiere of all four series of 21st Century Doctor Who to date; for more details on where the party will take place, contact him at jjbentham@aol.com. The previously-reported cover feature of the Christmas double issue of the Radio Times is by no means the only exposure Doctor Who is receiving from British TV listings magazines this Christmas. 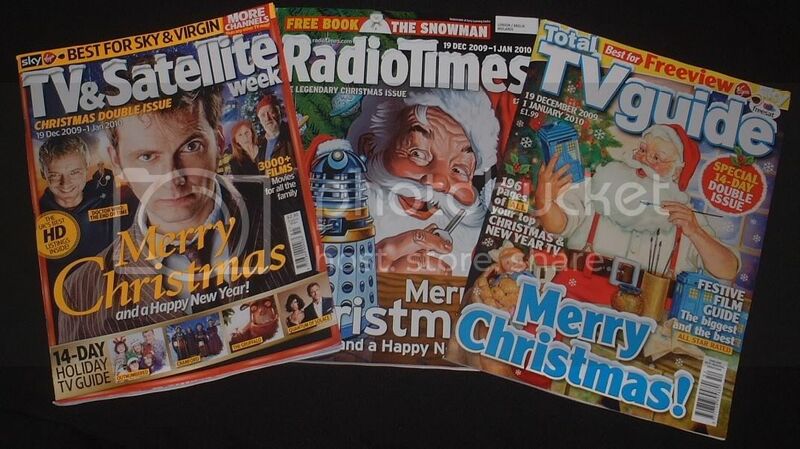 Most prominently, two other such publications have also produced Doctor Who-themed covers for their festive specials. TV & Satellite Week has a cover based around "The End of Time", while Total TV Guide's cover shows Father Christmas hand-painting TARDIS toys. The TV Times also features Doctor Who on its cover in a less prominent role, with an inset image of a Dalek promoting their own "Win a Dalek" competition. Inside, the Radio Times is filled with Doctor Who-related material and previews. There is an in-depth interview with David Tennant, where the actor speaks about his thoughts on moving on to the next phase of his career. 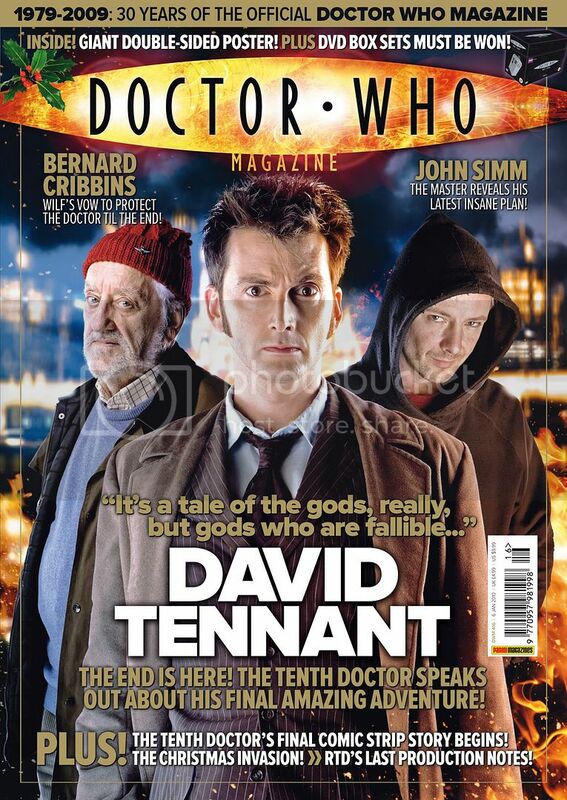 "Doctor Who has meant so much to me," he tells the magazine. "It's great to sign off with a flourish." Both parts of "The End of Time" are highlighted in the "Today's Choices" preview section for their respective days, with part one "Pick of the Day" for Christmas Day, described by the magazine's TV editor Alison Graham as a "thoughtful story." In the radio listings section, David Tennant's turns as interviewee (on Sunday 27th December's "Desert Island Discs") and interviewer (of Russell T Davies, on Tuesday 29th December's "Who on Who?") are also picked out as highlights of their respective days. Both TV & Satellite Week and Total TV Guide also speak to Tennant about how he feels to be giving up the role of the Doctor. "Being a celebrity doesn't sit easily with me," he tells the former. "It's part of the job, but if that died down it would be OK." In Total TV Guide, he says of his successor Matt Smith that "I think he'll be good for the role because he has an unusual look. He could be either 18 or 40. I hope that doesn't offend him!" 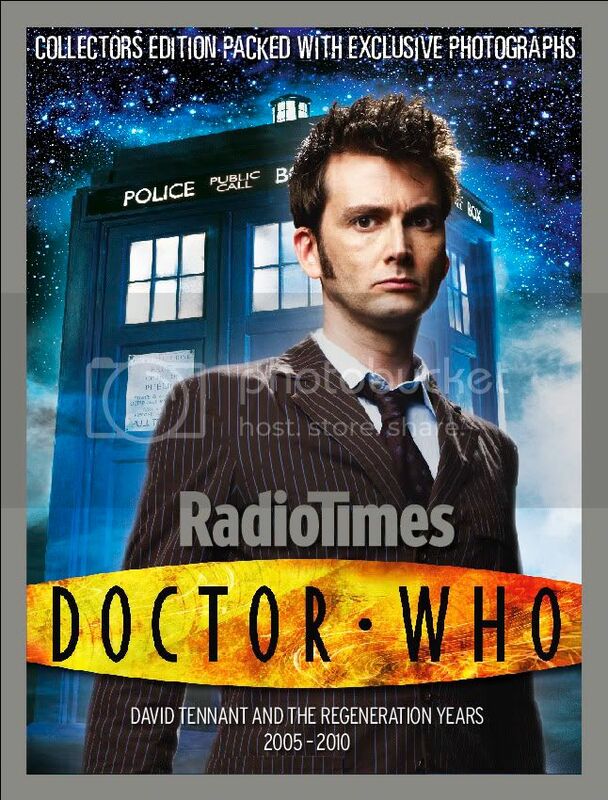 Both magazines make "The End of Time" their Christmas Day highlight, with TV & Satellite Week saying that "there's no doubt this year's two-part story will top all previous offerings," while Total TV Guide calls it "a fitting farewell for David Tennant's incarnation of the Time Lord." Both magazines also speak to Catherine Tate about her own Christmas special; she tells TV & Satellite Week of her appearance in "The End of Time" that: "It was sad, but I was delighted to be in the episodes. David is a brilliant actor and has brought everything he could to the role." You can keep track of all major Doctor Who-related programmes on British TV and radio this Christmas with our broadcast summary. Doctor Who Magazine 416 is the biggest-ever edition and, less than a month before he leaves the role, is a David Tennant special. Tennant gives an in-depth interview about his last days as the Tenth Doctor, the forthcoming Christmas Special, The End of Time, and the reasons why he’s decided to leave his dream job. "When the Doctor decides he’s the ‘Time Lord Victorious’, we’re making him quite unsympathetic", considers David. "Well, it’s making him more Time Lord, actually, when you consider how they turned out. When we see the Doctor behaving arrogantly, selfishly or uncontrollably, it’s then that he appears more fallible, and therefore more human? The Time Lords were pretty fallible too. It’s hubris. It’s Greek. It needed that scale to tell the final story. It’s a tale of the gods, really but gods who are fallible and, I suppose, human." AS TIME GOES BY With just two weeks to go until this year’s Doctor Who Christmas Specials, there is a taste of what’s in store, with dozens of new photos from The End of Time. He’s the Doctor’s most persistent Time Lord nemesis – the Master is back. John Simm explains why he couldn’t miss out on the Tenth Doctor’s final party. The Doctor’s faithful friend Wilfred Mott enters the TARDIS – and for Bernard Cribbins it’s his first trip into time and space for 43 years! Cribbins looks back over his long career. 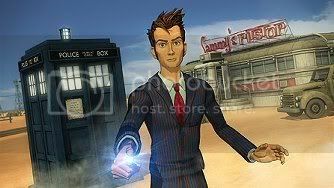 The Fact of Fiction turns back the clock to Christmas 2005, and the moment when we first met the Tenth Doctor – in The Christmas Invasion. Doctor Who showrunner Russell T Davies has written his very last Production Notes, what will be his all-important final word? A look back at the most memorable Doctor Who moments of 2009 in the Review of the Year. 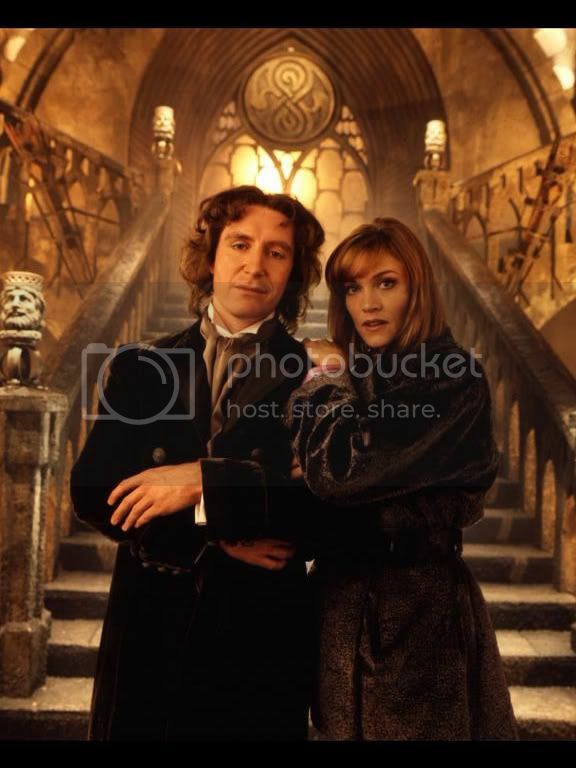 THhe Time Team relive the end of the twentieth century as they turn their attention to the Eighth Doctor’s only on-screen adventure, the 1996 TV Movie. The Watcher concludes his definitive guide to the Time Lord’s many incarnations by taking a close look at The Tenth Doctor. Catches up with the Sil, aka Nabil Shaban and find out what he thinks about Jonathan Ross, YouTube, weapons of mass destruction – and returning as Sil on audio. Plus The Watcher is back with the Christmas Quiz, there is a giant-sized, double-sided poster, and a chance to win the latest DVDs, CDs, books and audios – including the Doctor Who Series 1-4 box set. The Christmas edition of the Radio Times contains details of another Doctor Who-themed addition to the already-packed schedules of the BBC. On Saturday the 26th of December at 8pm, BBC Radio 4 will broadcast the one-hour documentary Doctor Who: The Lost Episodes, as part of its Archive on 4 strand. The documentary is produced by Shaun Ley, the same man responsible for the previously-reported documentary "Shelved", which looks at the abandonment of several 1970s television productions, including the 1979 Doctor Who serial Shada, and airs on Radio 4 this Saturday. "Doctor Who: The Lost Episodes" will look at how 108 episodes of the classic series came to be missing from the archives, and how efforts have led to the recovery of several more that were also previously thought lost. The programme will also be repeated, in a shortened 45-minute form and on FM frequencies only, on Radio 4 at 3pm on Monday the 28th of December. It will also be available internationally on the BBC website. The BBC's Doctor Who Advent Calendar isn't the only spot on the web with a daily Doctor Who treat this month. SFX is making a daily countdown to The End of Time on its blog. Highlights so far have included an interview with Russell T Davies, split into three parts here, here and here, as well as pieces on "27 Things SFX Loves About New Who", "How New Doctor Who Has Changed Everything" and "The Greater Spotted David Tennant"; the last includes a summary of all the places David Tennant will be appearing on UK TV and radio this month, as well as some that he probably won't but could. Meanwhile, the BBC's Director of Vision Jana Bennett, the woman in overall charge of the BBC's television services, has written a blog entry praising Doctor Who's place at the heart of the corporation's Christmas television line-up. Speaking of Tennant, filming has begun on the pilot for Rex Is Not Your Lawyer, the American TV series starring Tennant as a Chicago lawyer who suffers from panic attacks. The Sun, The Daily Telegraph and The Daily Star have short articles about Tennant's casting in the NBC series and his future in Hollywood. In other news, Karen Gillan's former drama coach brags about her ex-student in the Daily Record; thisissouthwales.co.uk has a brief item on an appearance by Colin Baker and 117 toy Daleks; and the Wigan Evening Post has an item on a Doctor Who fan who's built a replica TARDIS to raise funds for a local cancer centre. Finally, in response to a fan's query on Twitter, Star Trek: The Next Generation actor Brent Spiner expressed interest in playing a villain on Doctor Who. The 'fast-tracked' The Waters of Mars has debuted in Australia to modest ratings. The special averaged 731,000 in the five major capital cities. Though 'Mars' was still the ABC's top rating drama of the day and its second highest rating show after the 7pm news. The trailer for The End of Time also immediately followed the special, although the ABC is yet to confirm when it will broadcast the two-part special in the new year. The animated adventure Dreamland was watched by an estimated 0.45 million viewers on BBC Two for its first television broadcast. The six episodes have been available for UK viewers to watch online, but this is the first time the complete programme has been available. The audience share was 6.5% and the programme was the second highest-rated in its timeslot, getting double the audience of CITV. The HD audience was below the threshold for accurate analaysis. Here is a summary of some of the main Doctor Who-related programming across British television and radio over the forthcoming festive period. For a more comprehensive summary of all Doctor Who repeat broadcasts also taking place over the coming weeks, please see our sister site This Week in Doctor Who. Updates since 30th December have a red border. David Tennant reading How High is the Sky? The End of Time: The Doctor Who cast and crew discuss episode 1 of The End of Time. The End of Time: The Doctor Who cast and crew discuss episode 2 of The End of Time. Although BBC Television is only available in the UK, BBC Radio can be heard around the world via the BBC Website.